Love the tagline: Pure. Raw. Joy. And with a lineup of four high-profile founders that includes two foodie partners — Jordan O’Leary (Morning Owl coffeeshops) and Richard Valente (Fratelli restaurants and Roberto) — we’re betting Raw Pulp + Grind (440 Preston St.) sticks around. On trend with a gigantic selection of cold-pressed juices and smoothies, they also court the healthy eating crowd with acai bowls (basically a super-thick smoothie filled with fruits, granola, seeds, and nuts) salads, and raw wraps. 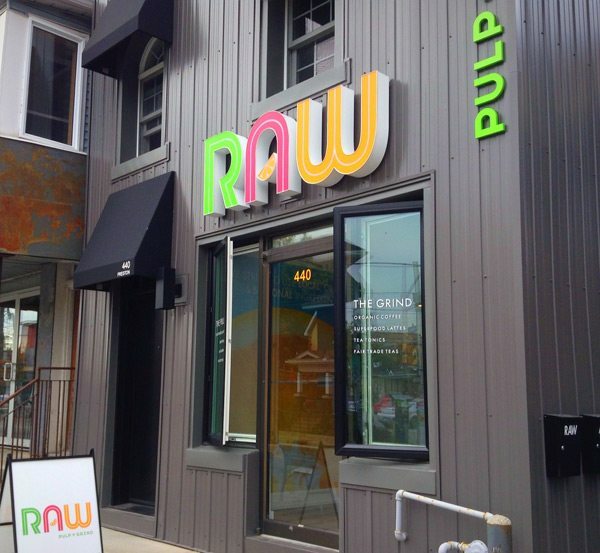 Raw Pulp + Grind is now open at 440 Preston St.
City Bites Hot Tip: Feeling intimidated by all this seriously healthy fare? Start slow with a gateway smoothie (we recommend the Coffee Chiller with espresso, coconut milk, Madagascar vanilla, and cinnamon), then work your way up over a week or two to the Core Green juice (kale, romaine, zucchini, parsley, celery, cucumber, lime and ginger).